Mariko Mori, a Japanese artist, has created Primal Rhythm to celebrate the winter solstice through the movement of the sun, tides and the sculpture itself. As we are at the moment of the December solstice (winter in the north, summer in the south), this work is an appropriate place to begin. After searching for a suitable site around the world for the sculpture, Mariko chose Seven Light Bay on a remote island south of Okinawa for the installation. This video was published in 2013 when the sculpture was still in the process of being created. It will take less than 3 minutes of your time to view. The others are shorter still. 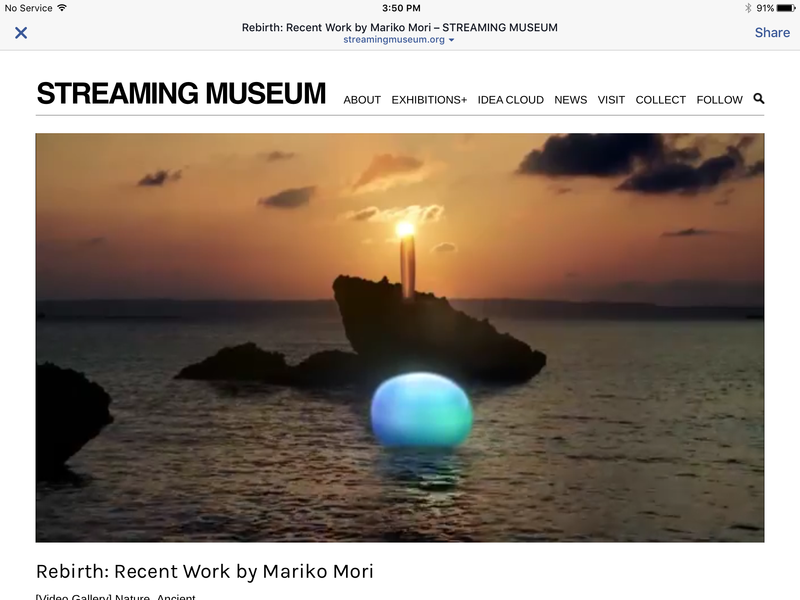 The video was posted by The Streaming Museum, a on-line museum that streams art works around the world. It produces and presents exhibitions and programs that have reached millions in public spaces, at cultural and commercial centers, and streamingmuseum.org. It is worth checking out in its own right. A screen capture from The Streaming Museum showing the artists impression of the final Primal Rhythm installation during the winter solstice at Seven Light Bay, Japan. “Since 1990 I have been occupied with creating new forms of life. No pollen or seeds but plastic yellow tubes are used as the basic material of this new nature. I make skeletons that are able to walk on the wind, so they don’t have to eat. Overtime, these skeleton have become increasingly better at surviving the elements such as storm and water and eventually I want to put these animals out in herds on the beaches, so they will live their own lives“. The following video shows a selection of his sculptures. They speak for themselves. 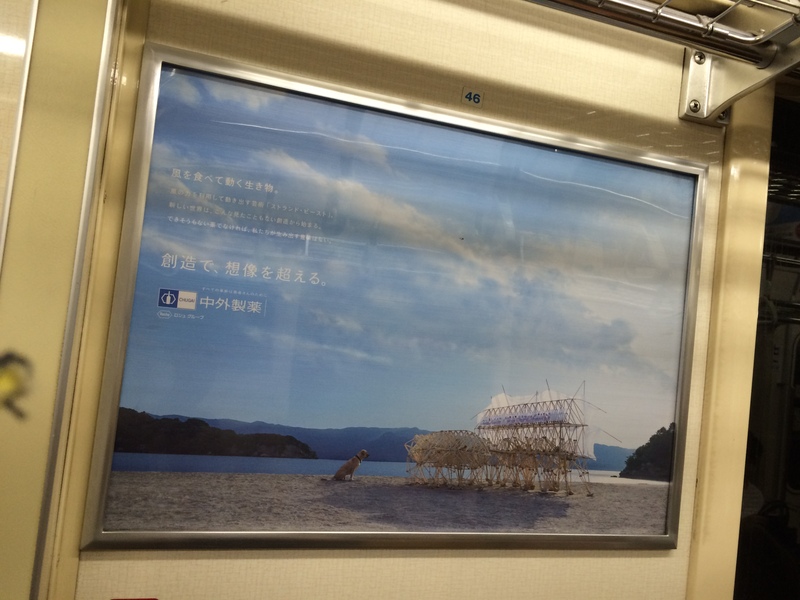 There is a longer video on the strandbeest website for those interested in watching more of these striking sculptures. Like Mariko Mori and Phil Price, Theo Johnson’s art is displayed and celebrated around the world. This image is from a subway train in Tokyo. The final video gives an overview of the kinetic sculptures by Phil Price, a New Zealander. Like Theo Johnson, he sees his sculptures as having a life of their own. The movement in his work is mesmerising and evokes the wind in action. To get a feel for how a single sculpture can capture your attention, you can watch this nearly three minute video of The Tree of Life. The Tree of Life sculpture by Phil Price is located at the McClelland Gallery in Melbourne, Australia. Each of the discs moves in a mesmerising motion, as shown in the video link above. I find all of these works inspiring and thought-provoking. I hope that you do as well. This entry was posted in Air, Europe, Japan, Popular culture, Spirit, Visual Arts, Water and tagged Air, Energy, Europe, Japan, kinetic art, Spirit, the elements, Water, Waves, Wind. Bookmark the permalink. The three examples of kinetic sculptures you have shared with us are beautiful to watch and definitely inspiring. I love the way Mariko Mori describes her installation and her intention behind its creation. It would be great to see it in situ! Theo Johnson’s work is mind-boggling; the fact that he was able to come up with the idea and then build these ‘creatures’ and have them appear so lifelike. 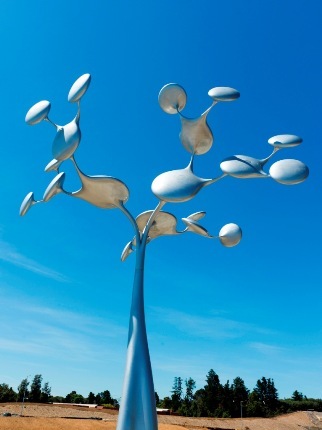 We saw one of Phil Price’s sculptures on a trip down to Frankston earlier in the year, called the Tree of Life. Seeing a sculpture moving in this way taps into our childlike sense of wonder. Even seeing them in the video causes one to feel awe. These three artists definitely stretch the traditional perceptions of sculpture. They also finally pushed me to learn how to embed videos in a WordPress blog, for which I am very grateful. I would love to see these sculptural works in situ. The place they are set in is as important as the sculpture, you could say that it was part of it – especially with the interactions with/inspiration taken from the local elements.